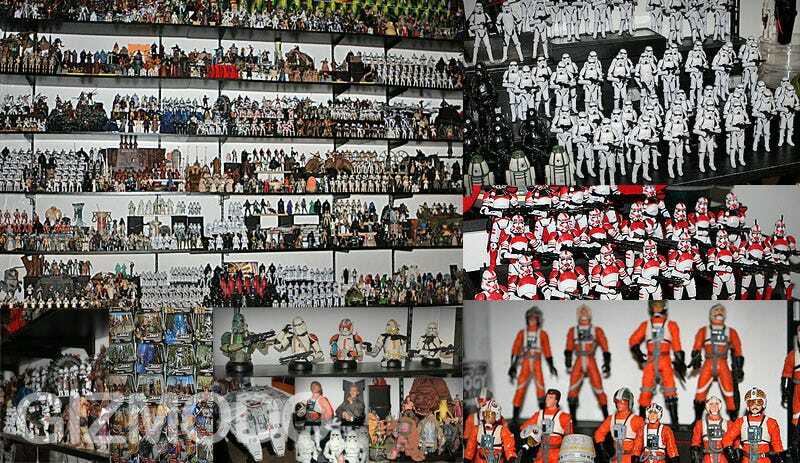 Rob Foster has almost all the Star Wars figures and models known to mankind, Hutts and Bothans. He and his girlfriend share their home with an overwhelming army of Star Wars collectibles, from vintage 1977 figures to full battalions of the latest Storm Troopers and giant Ultimate Collector LEGO models, in and out of their original boxes, in formation or reenacting movie scenes. Amazing 134-image gallery documenting every figure and angle, plus an exclusive interview with Rob after the jump. It's Toy Fair 2008 and Rob Foster is looking for what figures and models to get next. Every year, companies like Hasbro, LEGO or Gentle Giant release new products related to Rob's favorite toy franchise ever: Star Wars. Jesús Díaz: Hello Rob, stunning collection. The sheer scale, all those figures forming on the shelves, the models hanging everywhere, even all that LEGO stuff... it's just amazing. As I was going through each image, my only thought was: "omfg, it can't be real." So first of all: how many figures does your collection have? Rob Foster: In terms of 3 3/4" figures, I'd say that there are a little under 2,000 open figures, and 800 or so that are still in the packaging. JD: When it all started? RF: I started collecting in 1995 when Hasbro brought the line back. I was 15 at the time. JD: Long time. How much do you calculate it is all worth now? Something along the lines of the Transformers $1,000,000 collection? RF: To be honest, I have no idea. The vintage and Gentle Giant products do well when you're trying to sell them, but the modern stuff is over-produced compared to the 1970's and '80s. It's not about making money, so I don't worry about that. JD: You mention overproduction and I see that you really enjoy getting massive numbers of troopers as well as different models... inside all this plastic horde, are there any favorites? RB: Probably my favorite is actually the custom vintage Gargan. She was the fat dancer in Jabba's palace and was set to be made into the vintage line before it fell apart in the mid '80s. She was sculpted by Ryan Shaw to match the vintage style, and to my knowledge only about 25 of them were made. JD: What's the oldest one? RF: The oldest ones are the first series of vintage toys that came out with the movie in 1977. JD: And your latest acquisition? RF: I've slowed down a bit recently, but the latest items I picked up were Hasbro's new wave of figures, the 2008 models, wave 1. JD: What's the one that took longer to collect? You know, the one(s) you really went the extra mile to grab. RF: I've been very picky about the loose vintage set. I've been working on it off and on for about six or seven years now. It's taken a long time because they have to be perfect when it comes to paint chips and discoloration. Also, the accessories have to be original vintage too, no reproductions. I hope to get into that later this year. JD: So no reproductions whatsoever, all originals... what about custom pieces from independent model makers? RF: Apart from Gargan, I've stayed away from customs for the most part. JD: How often do you get there figures? Or in other words, are you done yet? RF: I'm certainly not done yet. I've been slowing down because I'm running out of room (everything has to be contained in that one room), but I want to get more into collecting vintage, and as long as Hasbro keeps making a solid product, I'll stick with the new figures too. JD: Do you think this is the most complete Star Wars figure collection in the world... or about to get that title, this side of Skywalker Ranch? RF: No, not at all. A lot of people tell me that it's way up there, but I've seen some pretty incredible collections over the years, lots of them with much more money sunk into them. JD: I also see you have the LEGO stuff; do you have them all? RF: I don't have everything Lego has put out, I've just picked up those here and there. The Ultimate Collector Series on the other hand, I actively collect. I just need to get around to buying the Death Star and Naboo Fighter to have them all. JD: I see the Ultimate Collectors... and the Falcon. How long did it take you to build it? RF: I'm guessing it took about 25-30 hours. I worked on it for a weekend and then in evenings after work for a few days. JD: I see you have many of the figures in their package yet. Does every figure (or almost every one of them) have the equivalent still inside the original packaging? RF: If a figure came on a regular card, I have it open and in the package. If it came in a big box like with a vehicle or a 5-pack, I only have them opened. JD: I think the only question left is how the heck do you support this amazingly dedicated hobby—what's your job? RF: I work in the Art Department at a visual effects / animation studio called Reel FX Creative Studios although my department is now being called "Radium Dallas") doing Motion Graphics work. We do a lot of commercials, but the most recent thing that I worked on that had anything to do with movies, was the opening credits for Mr. Magorium's Wonder Emporium. I animated about half of it. JD: And what does your other half thing about this? RB: She's great about it. When my girlfriend and I started shopping for a home, the only thing I asked for was an extra room to put the toys in. She fell in love with this place we live in now, which only has one bedroom and one large main room. I told her the toys were going in the bedroom, and she said that was just fine. So that's our shared bedroom and has been for the last five years. She's a champ!